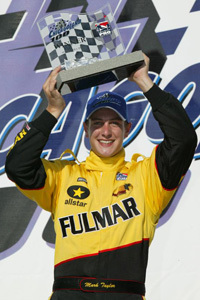 JOLIET, Ill., Saturday, Sept. 6, 2003 – Rookie Mark Taylor defeated Ed Carpenter by 0.0170 of a second to win the Chicagoland 100 Sept. 6 at Chicagoland Speedway in the closest finish in Menards Infiniti Pro Series history. The previous closest margin of victory occurred at Texas Motor Speedway in 2002, when A.J. Foyt IV defeated Cory Witherill by .0379 of a second. “A great race,” said Taylor, whose performance earned him a record sixth victory in 10 races. “Panther gave me a car just as fast if not quicker (than Carpenter), so we were able to run alongside him most of the race, run behind him, put it anywhere I wanted to. Carpenter started from the pole and led 56 laps of the 67-lap event in the No. 14 Futaba/Delphi Dallara, but a late-race restart set the stage for a last-lap duel. “I think the Futaba car was the better car, but that yellow at the end hurt us,” Carpenter said. “It was my best restart of the race, really. I knew I had to get through the gears cleanly, keep it on the bottom and make Mark go around the top. I think to be running second with just one lap to go might be an advantage because you can use the draft. Rookie Jeff Simmons started last but powered through the field to finish third in the No. 20 Western Union Speed Team Dallara/Infiniti/Firestone. Arie Luyendyk Jr. finished fourth in the No. 5 Dallara/Infiniti/Firestone, while Aaron Fike rounded out the top five in the No. 91 RFMS/Hemelgarn Racing entry. The 67-lap sprint was slowed twice due to accidents. The first occurred when rookie Paul Dana made heavy contact with the outside retaining wall in Turn 4. The final caution period occurred when rookie Marco Cioci made contact with the outside retaining wall in Turn 2. Both drivers were unhurt. Rookies hold the top two positions in the Infiniti Pro Series standings. Taylor leads Simmons 414-343, while Carpenter ranks third with 305 points.